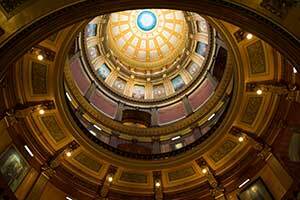 LANSING, Mich. — Sen. Dale Zorn attended Gov. Rick Snyder’s 2017 State of the State address on Tuesday night with Monroe County Circuit Court Judge Mark Braunlich. After the address, Zorn highlighted the governor’s plan and announced that he is reintroducing legislation to help prevent prescription drug abuse. “Once again, the governor kicked off the conversation for the year with his State of the State address, and I agree with several of his priorities,” said Zorn, R-Ida. “Continuing to increase funding for education — especially getting high school students the skills they need to work after graduation — is one of my top priorities. Expanding our economy, increasing trade and bringing better paying jobs to Michigan will benefit everyone. I am also interested in the governor’s ideas to fix our aging infrastructure, especially concerning water and road projects. On Wednesday, Zorn will reintroduce a bill from last session, Senate Bill 828, which would remove reporting exemptions for controlled substance samples, methadone treatment centers and buprenorphine prescribers. Zorn’s bill would require more reporting of controlled substances to the Michigan Automated Prescription System (MAPS). MAPS is the prescription monitoring program for the state of Michigan and tracks patients and prescribers for over-supply of Schedule 2-5 controlled substances.